The best equipment does not the runner make. But it sure does help a ton when you have all the comfort in the world and are trying to just.make.it.through the 6 miles that I’m going to run tomorrow morning. Side stepping my original subject for a minute, I’m looking forward to my quiet run tomorrow. Sir LAA has work all day and I’ve decided to set aside the group running club in order to take my 6 miles head on by myself. Let’s pray for good weather, shall we? But I digress. It’s nice to be comfy. The first major selling point of gear here…is weight. Don’t weigh yourself down. Light. Light. Light. But I do enjoy a few luxuries that I didn’t think I’d need when I started this “trek”. 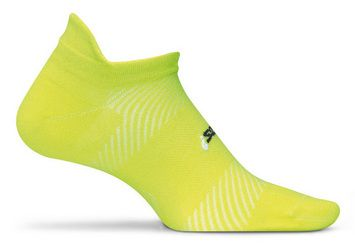 Right now, I thought there was no point to cushy running socks. White cotton socks just worked well for me. Not so said Sallee at Luke’s Locker. Ditto said Sir LAA. Now I’m all into my Feetures. Which admittedly, are worth every penny I spent on them. They are happiness on my feet – curving to the right places as there is, in fact, a specifically left and right sock. Admittedly, once you start with socks, you just keep working your way up. In the beginning, before my fancy running shoes, I actually picked up these compression sleeves to help. They look a little like I’m wearing ace bandages around my legs, which I guess could be a good substitute if you were an amazing wrapper, but that said, the pain was instantly gone that I used to experience. I’m still deciding if they are worth wearing to the first 5k though, as the shoes seem to be helping in the short runs. And moving ever more Northerly…I adore my Nike running knickers. They feel like velvet and running in them makes me, admittedly, feel super neato. Like I’m in this! I don’t care for shorts, because at my height, it seems I can’t find a pair that don’t ride up. These are perfect and keep me warm enough when the morning has a little nip to it and are cool enough after I’ve been going for awhile. Plus, throw on a cover up top afterward, and you’re ready to go shopping on the way home from the track. 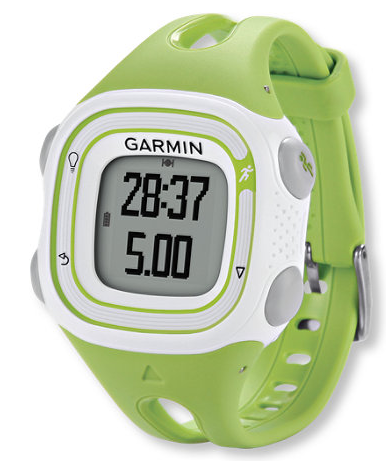 Moving right along, I’ve written about my running watch before. Sir LAA has the Garmin Forerunner 610, which I believe you can launch missles or rockets from NASA or something on. 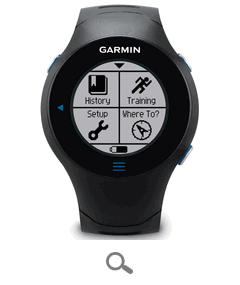 Mine, the Garmin Forerunner 10 is much more simple and to the point. I like mine more, but sure, everyone has a geek-dom and he needs his for like a million more data points in his advanced running echelon. For now at least, I like that mine has big buttons, easy interface to my computer and tells me my pace immediately after I finish a run – instantaneous pay off! Amen! That said, up on top rests what I find to be my most important piece of equipment. My earbuds. I’m still fighting my brain on my runs. I hear hit.hit.hit of my feet and I’m toast mentally. These really help me drown out the noise around me and the music come through purely. 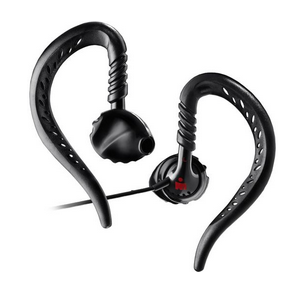 The quality of the buds are great and they are super flexible – my ears usually hurt after these wraparound styles and this version is super comfy. Definitely suggest them.